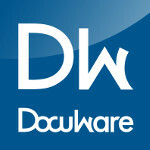 DocuWare, one of the leading providers of document management systems, has just released version 2 of it's successful free mobile app for scanning. Designed to help DocuWare users to scan documents in the DMS, it uses a smartphone's camera to take photos of documents, which it uploads as pdf. But first it crops and deskews them - which makes this app useful for anyone uploading any documents anywhere! PaperScan 2.0 is available from Apple or Google.